The debonair gentleman to my photograph clone’s right is Donavan Hall, craft beer writer, novelist, and one-third of Rocky Point Artisan Brewers, the microbrewery responsible for organizing last Saturday’s 2011 Long Island Nano Cask Ale Festival at DEKS American Restaurant in Rocky Point. 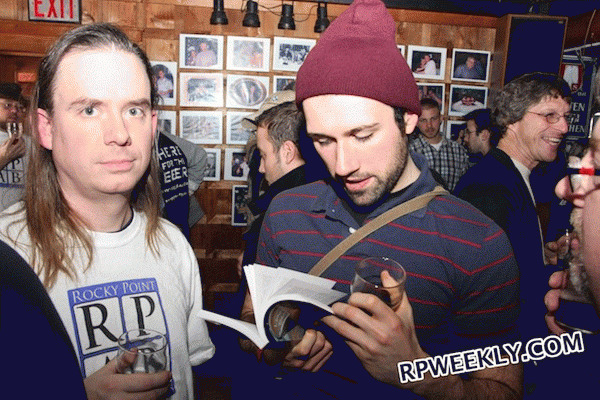 Photograph clone is leafing cellulose pulp pages of Hall’s brand new book, Long Island Beer Guide. This, the second version of Long Island Beer Guide (first was published in the summer of 2008), features extensive and updated information on Long Island’s continuing craft beer expansion, including newsies breweries and bars and beverage centers. Also includes Brooklyn and New York City words and sentences, too. “When I started covering the Long Island beer scene in 2006 I just decided that I would write a beer guide. I’m a writer, that’s what I do; I write books. So it was an obvious goal. Also, I realized that every great craft beer region had a guide, and so I figured that Long Island needed one if it was to become a great craft beer region. The first edition was a more personal view of Long Island craft beer spots. I wasn’t trying to be comprehensive. My purpose was to give people something to read and maybe inspire them to visit the best spots for craft beer. The second edition aims to be more comprehensive. Also, I’ve added chapters for Manhattan and Brooklyn. There’s a whole chapter devoted to beer cocktails. Plus I’ve expanded the “Craft Beer Companion” chapter, adding more articles on why drinking craft beer is important for the future of the human race. 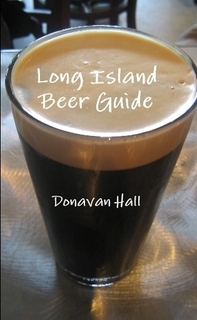 Purchase the current version of Hall’s Long Island Beer Guide here.